This is probably the most beautiful SCADTA "S" cover in existence. The cover has been send form Aarau (Switzerland) to Bogota on 16. September 1926 and has reached Bogota on 10. October 1926 (arrival postmark on back of the cover). It is fanked with a 30 c. meter stamp HELVETIA 30 c. in red ink and the additional SCADTA Consular Overprint 30 c. blue. On front there is the dispatch postmark Aarau, BRF. EXP, 16. September 1926, Transit postmark Bale 2, Outré Mar, 17. 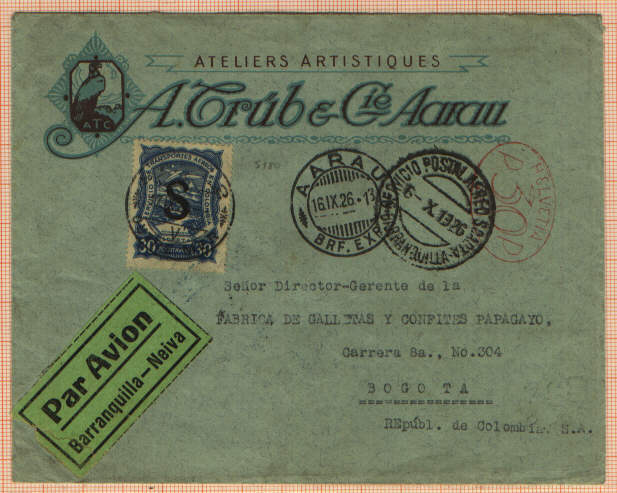 September 1926 plus the arrival postmark of SCADTA in Barranquilla dated 6. October 1926. On the back of the cover there is the arrival postmark of the Colombian National Postal administration... DESPATCHO EXTERIOR, BARRANQUILLA dated 6. October 1926 as well as the earlier mentioned arrival postmark of the SCADTA in Bogota.